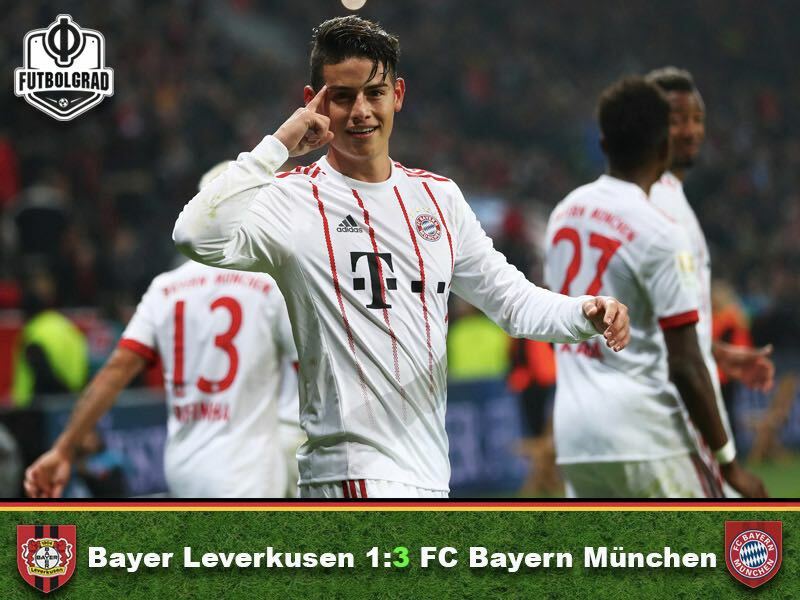 The Rückrunde kicked off with Bayer Leverkusen v Bayern München and the Rekordmeister continued its strong run with a convincing 3-1 victory. Javi Martínez, Frank Ribéry and James scored for Bayern. Sandro Wagner made his Bayern München debut. Volland scored the only Bayer goal. Bayer Leverkusen started the game with plenty of confidence pressing Bayern München right from the get-go. From then on a fast-paced game developed with both teams trying to press high. Bayer had a slight possession advantage in the early goings without creating any dangerous goal chances. The high press and aggressive play also had its price as both Karim Bellarabi and Kevin Volland received yellow-cards early on. Overall Bayer appeared overly motivated walking a fine line between high press and overly aggressiveness. In the 17′ minute Bayer was almost rewarded – following a corner Bayer midfielder Dominik Kohr was given to much room by James, but his free header missed the net by just a whisker. Following the Kohr chance, both sides continued their high tempo without playing structured football. At times both teams simply resorted to kicking the ball out of their half instead of cultivating a tactical game. As a result, the second chance of the game came after Bayer failed to cleanly play the ball out of the back allowing James a clear path on net from 24 yards out, which missed Bernd Leno’s goal by just a couple yards. Without structure, it was no surprise that Bayern’s goal would come from a flipper goal after Bayer failed to clear a ball after a corner-kick. Arturo Vidal headed the ball towards the net and after bouncing around would find Javi Martínez’s left-foot, and the Spaniard made no mistake scoring from close range in the 33′. The goal deflated Bayer and allowed Bayern to play a more cultivated style of football for the remaining ten minutes without creating any more dangerous moments. Bayern München started the second half dominant, but it was Bayer Leverkusen with the first big chance of the second half. In the 55′ Leon Bailey won the ball in Bayern’s half easily danced past Bayern’s Niklas Süle curling the ball Robbenesque from the right corner of the penalty box and only the crossbar prevented Bayer’s equaliser. In the 57′ Thomas Müller almost doubled the lead, his shot from outside the box missed Leno’s goal by just a few inches. Only one minute later Frank Ribéry was luckier after he broke through on the left wing stepped past a Leverkusen defender and then finished the move with a low drive that left Leno no chance. Two goals down Bayer Leverkusen added forward Lucas Alario in the 65′ in an attempt to get back into the match. With the extra forward on the pitch, Bayer hoped to create that moment that would see them get back into the match. That moment arrived in the 70′ after Kevin Volland won the ball on the edge of the box, stepped past three Bayern defenders and then let go a shot that was deflected first by Javi Martínez and then Süle leaving Bayern keeper Sven Ulreich without a chance. Leverkusen kept up the pressure and in the 75′ Volland received a great ball on the edge of the box from Kai Havertz, his shot, however, was blocked by a Bayern defender. Just one minute later Bayer came close once again this time Lucas Alario saw his shot from outside the box whistled past the crossbar. Bayern, however, managed to regain control of the match and Leverkusen was without a chance in the last ten minutes. Instead, Bayern would leave the last impression in the match with James Rodríguez scoring a wonderful freekick goal in the 90′. Bayern’s Colombian midfield magician James Rodríguez was the man of the match. The Colombian playmaker continues his excellent progress under Jupp Heynckes acting like a metronome in Bayern’s midfield playing 60 accurate passes for a pass accuracy of 90.9%. James set up Ribéry’s goal and then won the game for Bayern with a fantastic freekick in the dying moments of the game. Everyone expected Sandro Wagner to start the match. But Bayern head coach Jupp Heynckes surprised many by leaving the 30-year-old on the bench and instead started Thomas Müller up front. Wagner then came on with just over ten minutes to go in the second half. Not a fan of starting from the bench the forward would fail to make a significant impact. Frank Ribéry’s scores his first goal of the season. Ribéry’s goal makes him the first non-German to score eleven seasons in a row for Bayern München. Bayer have scored in every game this season and going back to last season the 23rd game in a row. Fedor Smolov – What is in the Cards for Russia’s Best Striker?